Stroke (Brain Attack) affects 15 to 20 lakh Indians every Year. Every 15 seconds one person gets a stroke in India.1/3 of stroke patients recover fully, while 1/3 recover with sequelae and the remaining third do not survive. Stroke may be due to blood clot in the brain arteries leading to reduced flow and death of brain cells (Cerebral infarction or Ischemic Stroke). Stroke may also be due to leakage of blood from the arteries (brain haemorrhage). 75 to 80% of strokes are due to cerebral infarction, while 20-25% are due to haemorrhage. The risk factors for stroke include: Age, smoking, alcohol abuse, high BP, Uncontrolled diabetes, high cholesterol and lipids, cardiac diseases such as valvular heart disease, atrial fibrillation, ischemic heart disease, heart failure. 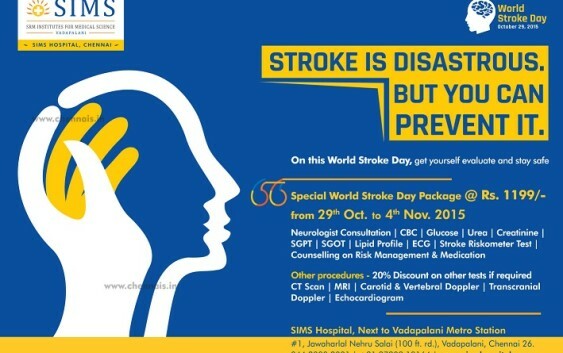 Stroke can be prevented by avoiding smoking and abuse of alcohol; regular physical exercise, eating plenty of fruits and vegetables and maintaining healthy weight; controlling BP, diabetes and cholesterol levels, proper treatment of heart disease and taking medication such as aspirin for persons with high risk of stroke occurrence. Dissolving the clots with clot buster drugs can be given within 4.5 hours of stroke onset only after thorough evaluation. Recent advances in stroke treatment include dissolving the clot through an angiogram and injection of clot busters directly in the artery; removing the thrombus. Narrowing of arteries in the neck can be treated by surgery (endarterectomy). Surgery is also done for treating brain haemorrhage due to aneurysms and arteriovenous malformations of the brain .